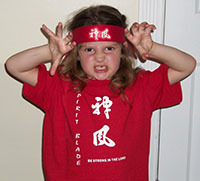 Sensei Steve's Karate Center is a Karate for Christ International Certified school. Sensei Steve is the current KFCI Illinois state rep. In August, 2006, Sensei Steve and a few students visited Midland Baptist Church in Midland MI. to perform a demonstration for the Asia Reach Ministries conference. Brother Bobby, Tim, and Daryl with Allie and Katrina Stone and Sensei Steve. For more info on KFCI or to donate please go to their website. Be sure to look at our Spirit Blade Ministries Page to find out how to book a performance for your church or event. Encouraging the message to BE STRONG IN THE LORD!